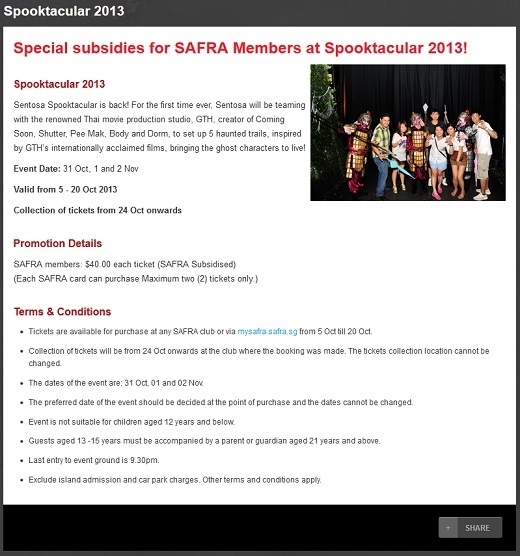 Sentosa Spooktacular is back! For the first time ever, Sentosa will be teaming with the renowned Thai movie production studio, GTH, creator of Coming Soon, Shutter, Pee Mak, Body and Dorm, to set up 5 haunted trails, inspired by GTH’s internationally acclaimed films, bringing the ghost characters to live! Promotion for event date: 31 Oct, 1 and 2 Nov 2013. Collection of tickets from 24 Oct 2013 onwards. For further information, visit SAFRA website.